Eiye stands for 'bird' in Yoruba language. Eiye is the name of one of the main college confraternities in Nigeria. Members of a Nigerian gang, which initiated new members by forcing them to drink human blood, were arrested in Italy as they prepared to launch a machete attack on their rivals. Police in the northern Italian town of Brescia mounted a night raid to stop the Eiye Confraternity, who are ethnically part of the Igbo tribe, from fighting members of the Bini tribe in Verona. They discovered a trove of machetes and axes, some of which had been allegedly used to amputate the limbs of previous victims. “We have been tracking this gang for two years and we arrested the men who we think are the bosses,” said Carmine Grassi, the head of the Police Flying Squad in Brescia. 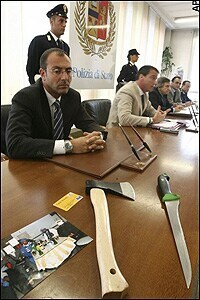 Five unnamed men, aged between 25 and 35, were arrested in Brescia, Turin and the southern town of Aversa, near Naples. A sixth man, who is already in prison for another offense, has also been served a new arrest warrant. Mr Grassi said the Eiye gangsters would be charged with several offenses, including running drug, extortion and prostitution rings and cloning credit cards. “The operation started after the Nigerian government warned us that several gang members had left Africa and spread into Europe. Other members of this gang are active in the UK, in particular, where they can get fake passports,” he said. “The gang is like a cult. Members all have to wear blue hats, clothing and blue shoes, and they often spoke in patois or code,” he said. “A new member would slice his veins and let out some blood into a bowl. "The other members would mix the blood with water and everyone in the gang would drink it,” he said, adding that detailed diaries had been found at the scene. “We moved to arrest them because we heard they were planning a mission to Verona to attack their enemies. "We found several machetes and axes, some of which had been used to hack off people’s arms,” he said. “Recently there has been a surge of violence in Turin, with rivals fighting each other,” he said. “We have been working together with Nigerian police to identify the criminals involved. Members of the Nigerian community have also reported several episodes of violence and helped us to infiltrate the gang,” he added. The Eiye Confraternity is only one of a series of Nigerian gangs. The cult gangs, which have names such as Black Axe, Buccaneers and the Vikings, were all formed at universities in Nigeria, along ethnic lines. The student gang members often launch vicious attacks on examination day against their rivals, and Lagos University now has to provide an armed guard on campus.